The Silent Isle: Where are your Thin Places? Where are your Thin Places? I have a friend. (believe it, or not.) She is brilliant and funny and creative and captivating and a marketing wiz. Her name is Karen Chronister. She is my writing buddy and traveling buddy and one of the few people I have found that my introverted self just doesn't tire of. I have a massive amount of admiration for her. So when she approached me a little while ago with a brainstorm, I was all ears. "The Thin Places." She says this and looks at me expectantly. I look down at my waistline and look back up. "Nope, I don't have many of those," I sigh. She chuckles. "No, The Thin Places. Places where the space between heaven and earth thins. Places where you know you're experiencing something transcendent and so beautiful it robs you of breath. Like when we first saw The David in Florence." We both pause, take deep breaths, and remember that awe-filled moment. "Or when we sat on our terrace in Rome." Another pause. "Or when--"
"--when we stood on that bridge over the Seine and listened to the bells of Notre Dame," I say. "Or we climbed to the top of Fyrish and looked out over the Black Isle in Scotland." "Exactly." Another pause. "Notice when these Thin Places appear?" she asks, leaning forward, dark eyes sparkling. I feel my own eagerness at the brilliance I know she's about to gift to me. "While traveling?" She then describes for me her vision. The Thin Places. An online community of adventurers who give honest reviews, share travel information and photos, and create and fulfill bucket lists. A free social networking site for travelers, (but without annoying ads or sponsored posts that clutter up in-boxes and news feeds.) There will be profile pages, blogs, contests, reliable and helpful information, travel tips, reviews, itinerary builders, and loads more. Now, I grew up in the travel industry. My grandfather started, and now my parents own and operate, a travel business. From an early age I rambled around on bus trips and plane rides. Family vacations consisted of traveling around the country scoping out possible venues and attractions for tours. As a college student I worked in my parents' business as a tour planner. Now, as an "adult" (ha! ), I help out as a tour director. I have taken student groups all over the map, both domestically and internationally. I also contribute travel writing for their company travel blog. I've been, in a way, bred for travel. So, as Karen sits in front of me, hands in motion, almost squirming in her excitement, I am immediately on board her ship and ready to steam full speed ahead. Know why? Because not only is it a brilliant idea, the linchpin of the idea is my favorite part of traveling: The Thin Places. These places where, as Karen states, "the veil between heaven and earth disappears, and our chest aches at the hush." This is why I travel. To feel the ache. To hear the hush. To see the air thin and heaven touch down on earth. I found one of those places, for only a few seconds, today on my drive to work. It was still dark and raining hard. I drove through a covered bridge. I heard the clack of the wood planks beneath the tires. The rain stopped beating the windshield. Light from my headlights lit up the rafters of the bridge. And I felt a momentary hush. (Bridges often bring me to this place.) And I know there are many travelers who also are in search of these places as well. That's why I'm a believer in Karen's vision. So we're moving up the ladder to the next rung, moving from brainstorming to implementing. Karen is working on creating a stunning website and has already claimed space on Facebook, Twitter, and Pinterest. (Feel free to follow! We don't bite, I promise. . . I haven't bitten any of you, yet, right?) And if you want to hop on the train with us and enjoy the ride from the the very beginning, you can click here and sign up to receive updates on when the site is launched. Karen and I in Scotland--see, not scary. Okay? So, my question for you is: Where have you experienced a Thin Place? I think I experienced one of my first "real" thin places in Vietnam. We'd been crawling around tunnels, all hunched over in the dark and dank, suppressing complete panic. Suddenly, the tunnel's path began to slope steeply upward, which was a fantastic change from the steep downward trajectory that led to the point of no return. We emerged from the tunnel, blinking, out of the side of a mountain and onto a pine-edged beach overlooking the ocean. The pine trees smelled intoxicating, the sun peeked through the clouds, and the waves lapped quietly on the shore. I went back into three more tunnels for the promise of that sight at the end of each. It's a metaphor, I think. But I've never been more in touch with my own heartbeat - its rapid, frantic beating in the tunnel and its near stop at the end. amazing, Katie. What an experience. I cannot imagine the darkness and then the power of light dispelling that dark. Heaven, indeed. That would be sure to leave you breathless. Thank you for sharing this thin place! I was hanging on your every word, Katie! Thank you for sharing that story! What a fascinating concept! My thin places tend to be in nature, like a simple walk in the woods (alone!) But there is a stupendous variety of natural wonders in this country alone, not to mention the rest of the planet. A specific experience that comes to mind is scuba diving in Bonaire and swimming over the crest of the reef wall to see the ocean plunge out of sight below me. Seeing my own private rainbow in my backyard (below the tops of the trees) was pretty cool too. To see the breadth of even a small part of the ocean always makes one feel very small, yet not insignificant, which is always a wonder. Love these thin places, Lisa. Thanks! 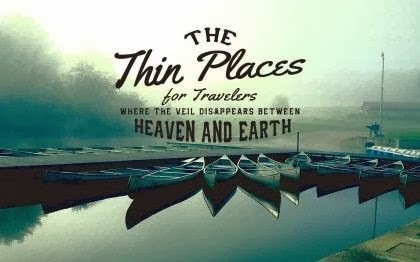 I love that idea, "The Thin Places." The descriptor really caught me, because it is also why I travel. One of my thin places was in Ireland. I met a older man in Galway who sat down with me at a pub and told me the most beautiful and mystical tales I had ever heard out loud about a visit he had to the Aran Islands. So naturally, I went there, and the place is most definitely where the faeries live. In a pinch I can't give it an accurate description, but I'll keep thinking on it for when the website it finished. Great idea Karen and Anna...excited to see where this all goes! Mmm, Ireland was indeed magical and "Thin" :) Thanks, Beth. Love seeing you here and hope to see you at The Thin Places when we're up and running!